Quality Air Heating and Air Conditioning > Articles > Heating > Is This the Year for a Heating Replacement? Is This the Year for a Heating Replacement? We are definitely getting closer to the spring season, and the warmer temperatures that come along with it. That being said, you are going to need your heater for a while longer, of course. Even so, now is a good time to start weighing your options if you are planning on replacing your heating system once the cold weather is gone for another few seasons. 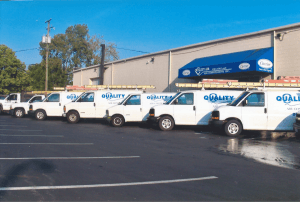 If you do think that now may be the right time for a heating replacement in Columbus, OH, take these factors into consideration. There are a number of reasons as to why you may choose to replace your heater, and we are here to get the job done properly regardless of your motivations. Your heater may be running pretty well, but if it is approaching or has already surpassed its expected lifespan, it may be time to consider a heating replacement. Your heater is most likely to break down on you during the coldest time of the year, when it is running its hardest. You cannot afford to push the limits of your system if it means putting your comfort at risk. We understand that you want to get the longest life possible from your heating system, but a heater of advanced age may be better off replaced ahead of a complete breakdown. Are You Satisfied with Its Efficiency? It is possible that your heater is functioning just as it should be, while still giving you reasonable cause for a replacement. If your heater is of a certain age, or if you invested in an inefficient heater at the time of purchase due to budgetary constraints, you may be paying more than you should have to in order to heat your home. Investing in a newer, more efficient system will allow you to save money in energy costs over time. Does It Require Frequent Repairs? We value our customers, but we know that you don’t necessarily want to be calling our technicians for a visit on a regular basis. If you are paying for frequent heating repairs, investing in a newer, more dependable heating system can help you to heat your home with greater reliability. You’ll also save money thanks to reduced repair costs. Schedule your heating replacement with Quality Air Heating and Air Conditioning.